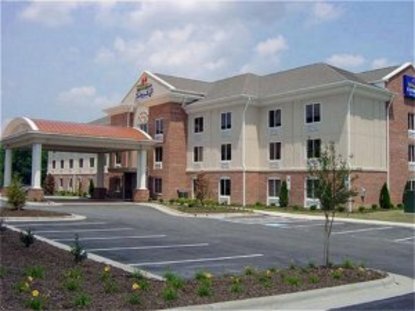 The Holiday Inn Express Hotel & Suites High Point South is conveniently located on I-85. Located 80 miles north of Charlotte, and 18 miles from Piedmont Triad International Airport, the hotel provides local access to many interests. The International Home Furnishings Market and High Point Furniture Outlet shops are four miles away, Emerald Point Water Park -10 miles, Zoo Asheboro- 25 miles and Charlotte Motor Speedway- 70 miles. We offer Free High-Speed Internet access in all rooms, free local calls and many on-site business and personal amenities. Our hotel staff speaks both English and Spanish and are on hand for 24 hour faxing and copying needs. Forgot something&reg Ask our friendly front desk staff for complimentary toiletries. We pride ourselves on clean and convenient service. This hotel is committed to providing accessible facilities under the American Disabilities Act. If your accessibility needs are not met, please contact the Hotel Manager on Duty. Should you require additional information regarding accessible facilities for guests with disabilities, please call 1-800-Holiday (U.S. and Canada) or contact the hotel directly. For the hearing impaired, TDD service is available at 1-800-238-5544 within the U.S. and Canada.